What Is Considered Vintage Rolex? The other day while talking to a friend, they asked a very simple question that isn’t so simple to answer. Their question: what is considered vintage in terms of Rolex watches? We take a personal journey into answering that question, and revisit what it means when we say Rolex is Timeless. Ever wonder how someone becomes a watch addict? I can’t speak for anyone else, but I thought it might be interesting to trace my evolution from a kid interested in watches to an adult who collects them and writes about them by looking at a few of the watches I collected along the way. Does Santa wear a Rolex? The answer is maybe. Does Santa wear a Rolex? The answer is maybe. Does Rudolph? Well, neigh. Here’s a question we hear often: How do I wind a Rolex watch? Dog whisperer? Try watch whisperer. Or, more specifically, Rolex whisperer. 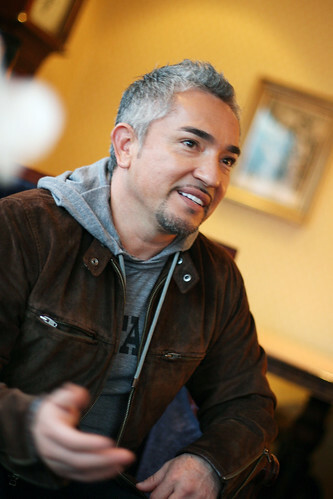 Cesar Millan, better known to dog lovers as “the dog whisperer,” is an avid Rolex collector. He’s been photographed wearing a Supercase Stainlesss Steel Submariner, among other Rolexes. Spotting A Fake Rolex, How Can I Tell If A Rolex Is Real? Here’s something I hear almost every day: How can I tell if a Rolex is real? Unfortunately, as with other quality items, cheaper knockoffs of Rolex watches can be found on the black market. They’re easily spotted by the trained eye, but people who want a quality status-symbol watch, the best of the fakes are difficult to spot. First tip. If it’s cheap, it’s not a Rolex. And by cheap, I mean below five figures. Rolex timepieces are expensive, and they’re expensive for a reason. Like Ferraris, Rolexes are hand-crafted and of the utmost quality. Like Ferraris, Rolexes are rather rare. There simply aren’t enough of them on the resale market to dilute their value. Oftentimes Rolexes appreciate in value over the years. So if someone tries to sell you a $1,000 “Rolex,” beware. It’s almost never an actual Rolex. Here’s another key tip. If the second hand doesn’t sweep -- if it ticks from second to second -- it’s not a Rolex. But go beyond that tip, because some fake Rolexes have been found with sweeping second hands. Look at the backing. Many fakes have clear backings to see the mechanisms working; real Rolex watches never have clear backings. Also, true Rolex watches have no markings on the case backing. Most knockoffs have engravings of the Rolex logo or other hallmarks to make you think it is real. Genuine Rolex models are shipped from the factory with a hologram-encoded sticker on the caseback. This sticker features the familiar Rolex crown logo positioned above the watch's case reference number. The hologram can be easily identified by viewing it from different angles. Authentic Rolexes will have a glass bubble attached to the crystal, positioned over the date. Its purpose is to magnify the tiny aperture and does so at 2.5 times magnification. On most counterfeit models, the date magnification is much less. Those are the most basic of tips. Be careful out there, folks. I’m glad you asked. There’s a simple answer. Simplicity. For the finest of quality timepieces, Rolex maintains a level of simplicity that makes its watches so perfect. Just check out its designs. You’ve got the Submariner, the classic diver’s watch that sets the standard for technology and durability. You’ve got the Datejust, a classic formal watch that sets the standard for style and grace. You’ve got the Daytona, the classic sports chronograph that sets the standard for precision that is often imitated. Instead of releasing new models, Rolex constantly refines its existing designs. Each watch contains the suggestions and wearing experiences of countless people who together have helped create timepieces that look good and work well. Let’s look at one design more closely. The Rolex Submariner is based on the classic “Oyster” water-resistant watch cases. It’s designed to be easy to read in most conditions – including under water – and it has a comfortable and reliable construction. It has achieved an almost impossible task: looking good on everyone. That brings us to our next brain teaser: Is it the watch or the wrist? Think about that. We’ll get back to you. Your First Rolex: Choices, Choices! So you’ve been bitten by the bug, huh? You’re looking at Rolex watches and you want one…but which one, right? Relax and take a deep breath—we’ve all been there. Pull up a chair and kick off your shoes, you’re among friends. Let’s talk watches. It will probably come as a surprise to some regular readers of this blog to hear me say it, but I don’t really believe it was the Tool Watch that entirely made the Rolex reputation. They played a crucial role to be sure, but it was something that came before that line of professional watches that truly established Rolex as an innovator in the field. Which Rolex Is Easiest to Resell? A common question on the watch forums is which Rolex holds its value the best, and or provides the safest bet in terms of a quick sale if the owner wants or needs to sell the watch. A quick perusal of WTS(Want to Sell) and WTB(Want to Buy) ads on the forums is a clue. The watches that seem to sell the fastest, and in the most demand, are the…drum roll, please…stainless steel Rolex Submariners.